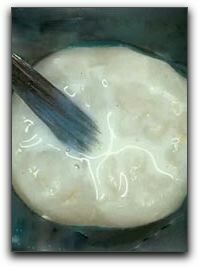 Sealants are a thin coat of clear resin that is applied to the biting surfaces of teeth. Teeth with deep pits and grooves can easily trap bacteria that can later lead to decay. Sealants fill in the pits and grooves to create a smooth surface. Dr. Stewart and Dr. Hull recommend sealants on permanent, unrestored, back teeth for patients of all ages; from young children to mature adults. Sealants are usually placed on the molars of our pediatric patients but in some cases anterior (front) teeth can benefit from sealants. At Stewart & Hull, we take special care of our Comstock Park, Walker, Grand Rapids and Rockford, MI patients. We want each child’s dental visit to be pleasant and painless so they will never develop a fear of the dentist. We advise parents on the specific dental issues associated with each stage of childhood. Ask us about fluoride, sports mouthguards, and orthodontic treatment. Call our office at 616-827-7019 to schedule a pediatric dental exam. We provide comprehensive restorative and cosmetic dentistry for Comstock Park people of all ages. You can learn more about our practice at https://www.greatmismiles.com/meet-dr-bruce-stewart.